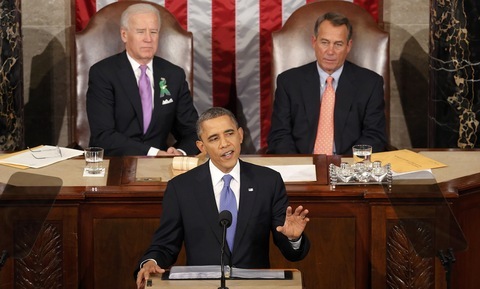 President Barack Obama’s State of the Union, which called for bipartisanship in Congress on a swath of issues — from economic policy to gun control and immigration reform — didn’t fall onto deaf ears. Multiple members of Congress from both the Republican and Democratic parties described their reactions to the State of the Union address Tuesday night. And many were optimistic of the possibility for compromise across party lines. Rep. Bob Goodlatte, R-Va., who as House Judiciary Committee chairman will play a key role in Congress’ work on immigration, gun violence and other wide-ranging bills, spoke about the need to enforce laws as well as reassure a doubtful public with bipartisan immigration policy. President Obama asked for similar measures in his address — tightening U.S.-Mexico border security, establish a pathway to citizenship for undocumented immigrants and reform the current immigration procedures. “Send me a comprehensive immigration reform bill in the next few months, and I will sign it right away,” he said. Rep. Raul Labrador noticed the passion in Mr. Obama’s voice on gun issues, too. But the Idaho Republican felt that overall, the address lacked a certain oomph and cohesive resonance. He called it “one of the worst speeches” he’s heard from this president. Still, he agreed with Mr. Obama on bipartisan immigration reform, and noted that Congress may be in a “golden moment” to find common ground for legislation on the issue. “There’s many Republicans — myself included — that have moved a little bit to the center on this issue. And it’s time for the president and his party to kind of join us in the middle,” he said. Newshour Reporter-Producer Josh Barajas shot these videos and Mike Fritz edited them. NewsHour Capitol Hill Producer Linda Scott coordinated interviews, and Reporter-Producer Katelyn Polantz and NewsHour intern Alyssa Goard assisted in production.